Rev-Air Innovations has teamed up with one of Canada’s largest HVAC manufacturing and R&D companies to design and engineer the Dynamic Air Diffuser. With this manufacturer having the excellent reputation that it does, we are able to guarantee a quality and on time product. We have worked very hard in the design and testing and feel pretty confident that we are the ‘Rolex’ of the diffuser industry. The Dynamic Air Diffuser acts as both an air diffuser and a ceiling fan by utilizing the forced air from the operating HVAC units in your building. The Dynamic Air Diffuser requires no power to operate therefore saving in operating costs as well as installation and material costs. With the Dynamic Air Diffuser running at greater cfm’s in the duct system, Rev-Air Innovations is able to show that less duct runs will be added at design time, again saving money on materials, installation and balancing. You would think that adding more cfm through the duct that noise would become an issue, but the Dynamic Air Diffuser not only performs at low NC values but distributes a throw of air greater than that of your average static diffuser. 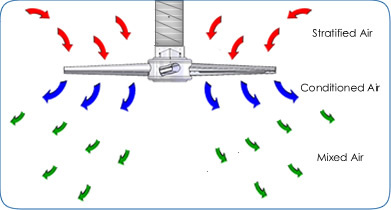 The air is distributed from the ductwork into the hub of the Dynamic Air Diffuser into the blades and through the engineered linear slots thus turning the hub and blades. This innovative design will prevent the irritating hot and cold spots that we see when improper duct and static diffusers are used. 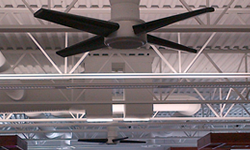 The blade design and angle of the blade was engineered for optimal de-stratification of the air above in the ceiling space. Buy mixing this stratified air with the newly conditioned air; we can assist in providing a more ‘floor to ceiling’ even temperature. The Dynamic Air Diffuser will not only provide more comfort in conditioned spaces but will add architectural design to any building, while at the same time, saving you money. For more information on Rev-Air Innovations and the Dynamic Air Diffuser please contact us. Latest Projects - The following galleries show the installation of the Dynamic Air Diffuser in different ceiling applications. 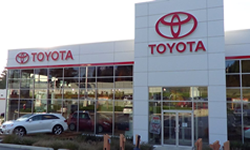 New Toyota dealership installs the Dynamic Air Diffuser in key locations in their newly constructed building. 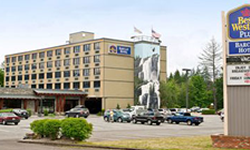 Installation of the first two Dynamic Air Diffusers in the market added a great architectural design The Dynamic Air Diffuser was installed as a retro-fit in the main lobby of the Best Western Hotel. Copyright © 2012 Rev-Air Innovations Inc. All Rights Reserved.